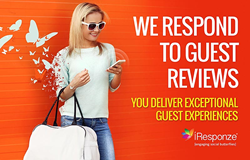 iResponze®, a unique online reputation management service, has completed a year-long pilot program with a group of Marriott International hotels that has paved the way for serving a larger portfolio of Marriott properties. Hotels from the select service and extended-stay portfolios participated in the pilot. We learned through the pilot program that iResponze was an effective tool to help us. "Our ability to expand the relationship with Marriott is the result of this successful pilot,” noted Rose Mentrie, Chief Innovation Officer for iResponze. “We were able to demonstrate the value of our guest review response services to not only the staff at the hotels but to the ownership interests.” During the pilot program, consistent feedback from the hotel leadership pointed to this service as allowing them more time to focus on the guest experience while the guest was on property versus post stay. Hotel leadership also quickly achieved a comfort level with the iResponze team, which demonstrated an understanding of the properties and responding to guest feedback in voices that were representative of the brand and hotel leadership. Jim Shumaker, Assistant General Manager, Courtyard by Marriott San Francisco Downtown, acknowledged that today’s travelers rely on online reviews in making hotel stay decisions, often evaluating a hotel not only on what the guest reported but how the hotel responded. “We want to be genuine and timely in our responses to guests,” said Shumaker, whose hotel participated in the pilot. “We learned through the pilot program that iResponze was an effective tool to help us meet Marriott’s brand standard – without hiring an additional staff member.” Like many hotel companies, Marriott has recognized the power of reviews and has established metrics for hotel responses. “Because of the successful pilot program, we have an opportunity to talk to additional Marriott properties with the power of proven results,” Mentrie added. The company will host webinars exclusively for Marriott owners and general managers to introduce the full scope of benefits from the iResponze online reputation management service. Information on iResponze services and upcoming webinars can be found at http://www.iresponze.com/marriott.